Funimation Films is bringing back the wizards from "Fairy Tail" to U.S. and Canadian theaters this August to unleash a new tale of destruction. "Fairy Tail: Dragon Cry," from the critically acclaimed original creator of "Fairy Tail," Hiro Mashima, is the newest feature-length film and second from the franchise in five years. The movie will be screened in approximately 300 U.S. and 12 Canadian locations during its limited theatrical release – on August 14 in Japanese with English subtitles only then in English dub only on August 16, August 17(Canada only) and August 19 (matinee screening). Starting on July 14 fans can purchase advanced tickets to "Fairy Tail: Dragon Cry" as well as watch the official theatrical trailer at funimatonfilms.com/fairytail. "Anime fans have been clamoring for more 'Fairy Tail' since the current anime series wrapped last year and 'Fairy Tail: Dragon Cry' is exactly what they've been waiting for," Gen Fukunaga, founder and CEO of Funimation, said. "Creator Hiro Mashima has brought his wizards back together for their most exciting and deadliest mission ever. And A-1 Pictures truly brings his story to life on the big screen. 'Fairy Tail' fans new and old will not want to miss 'Fairy Tail: Dragon Cry' this August." 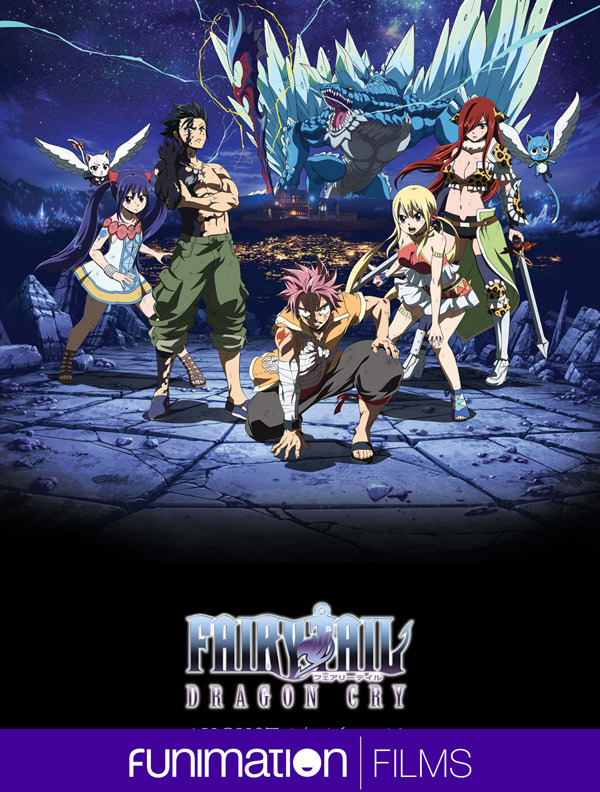 "Fairy Tail: Dragon Cry" is based on the New York Times best-selling "Fairy Tail" manga series with more than 2 million copies in print in the U.S. The film was directed by Tatsuma Minamikawa and produced by A-1 Pictures, the behind number successful series including "Sword Art Online," "The Seven Deadly Sins," and "Black Butler." "We are excited to unleash this new tale of destruction 'Fairy Tail: Dragon Cry' in theaters this August," Michael DuBoise, EVP and COO of Funimation, said. "'Fairy Tail' ranks as one of the top franchises with our fans and this exciting new film from Hiro Mashima and A-1 Pictures will further cement its popularity. I encourage fans to pre-order tickets now so they don't miss out on this chance to see their favorite magical guild in theaters." Natsu is known as the one and only fire-breathing Dragon Slayer, but this next adventure will take him to the next level. Luckily, he still has his trusty team by his side: Happy, a flying cat; Gray, an ice mage; Erza, a knight who switches armor and abilities mid-battle; and Lucy, a wizard who fights with a set of celestial spirits. Enter the Dragon Cry, a magic staff rumored to possess the power to destroy the world. For years, it's been safely guarded in the Kingdom of Fiore until Zash, a traitor of Fiore, steals it and delivers it to Animus in the Kingdom of Stella. Now it's up to the gang to infiltrate the Stella Kingdom and retrieve the staff. It seems like it should be an easy job, but what they uncover isn't what they expected. Like Funimation on Facebook at facebook.com/funimation and follow on Twitter at @funimation and on Instagram at instagram.com/funimation.